So what’s happening here? Well the first thing you see is the definition of our StarHScale widget that is a subclass of gtk.Widget, which is the base class for all widgets in PyGTK. Then we have a rather simple __init__ routine where we set some parameters (the max number of stars to show and the current number of stars to show) and initialize the parent class. The next function we will write is the do_realize() function. The do_realize() function is related to the gtk.Widget.realize() function and is called when a widget is supposed to allocate its GDK windowing resources. 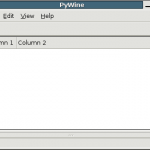 gtk.gdk.Window is a rectangular region on the screen. It’s a low-level object, used to implement high-level objects such as gtk.Widget and gtk.Window. A gtk.Window is a toplevel window, the object a user might think of as a “window” with a titlebar and so on. A gtk.Window may contain several gtk.gdk.Window objects since most widgets use a gtk.gdk.Window. A gtk.gdk.Window object interacts with the native window system for input and events. Some gtk.Widget objects do not have an associated gtk.gdk.Window and therefore cannot receive events. To receive events on behalf of these “windowless” widgets a gtk.EventBox must be used. # Create a new gdk.Window which we can draw on. # the style (theme engine) tells us. There is quite a bit of code here so I’ll take some time to explain it. The first step is to set a flag so that lets us, and anyone else that wants to know, that we have been realized – that we have a gtk.gdk.Window associated with ourselves. We add a few events to the event mask of the gtk.gdk.Window because this widget will be interacting with the mouse. Then we make some necessary connections between the gtk.gdk.Window, the widget, and the widgets style. Finally we set the background colour and move the window into the position that has been allocated for us (self.allocation). A gtk.gdk.Pixmap is an offscreen gtk.gdk.Drawable. It can be drawn upon with the standard gtk.gdk.Drawable drawing primitives, then copied to another gtk.gdk.Drawable (such as a gtk.gdk.Window) with the draw_drawable() method. The depth of a pixmap is the number of bits per pixels. A bitmaps are simply a gtk.gdk.Pixmap with a depth of 1. (That is, they are monochrome pixmaps – each pixel can be either on or off). The star is based off of star found in the Art Libre Set of the wonderful Tango Desktop Project. I simply darkened it a bit. Then we make a quick reference to the normal state foreground gtk.gdk.GC (graphic context) associated with our style. A gtk.gdk.GC is simply an object that “encapsulates information about the way things are drawn, such as the foreground color or line width. By using graphics contexts, the number of arguments to each drawing call is greatly reduced, and communication overhead is minimized, since identical arguments do not need to be passed repeatedly. (From the PYGTK Docs )” So it’s basically a bunch of drawing settings encapsulated in one simple object. Finally to finish off the do_realize() function we connect ourselves with the “motion_notify_event” which we will use to track when the user moves the mouse over our widget. on a widget to ask it the widget how large it wishes to be. #move over by 22 pixels. which is the size of the star. Basically we simply loop through the current number of stars (self.stars) and draw our star pixmap to the window using the draw_drawable function. We use the self.sizes list (which we calculated in the __init__ function) to determine the x position where we will draw the star. It turns out, however, that there is a problem with just specifying POINTER_MOTION_MASK. This will cause the server to add a new motion event to the event queue every time the user moves the mouse. Imagine that it takes us 0.1 seconds to handle a motion event, but the X server queues a new motion event every 0.05 seconds. We will soon get way behind the users drawing. If the user draws for 5 seconds, it will take us another 5 seconds to catch up after they release the mouse button! What we would like is to only get one motion event for each event we process. The way to do this is to specify POINTER_MOTION_HINT_MASK. # information, if not it’s all we need. This function is pretty simple, first we check to see if the event is a hint or not, if it is a hint we ask GTK+ to get us the real pointer information. If it is not a hint then we just collect the information from the passed gtk.gdk.Event object. Then we check the events state to make sure that the left mouse button is down, and if it is we pass the x coordinate of the mouse pointer to the self.check_for_new_stars() function which will determine how many stars should be shown. This function is very simple, first we check to make sure that it was the left button that fired the gtk.gdk.BUTTON_PRESS_EVENT, and if it was we pass event.x (the position the mouse was in at the time of the event) to the check_for_new_stars() function. set_value() is another simple function that performs a few validation checks and then sets the current number of stars. If the number of stars has changed, the widget will be redrawn. Whew! So that’s it, I hope that you found this tutorial useful, now the next step (in the next tutorial) is to add it to the gtk.TreeView. For some reason, this script doesn’t work for me – I just get an empty window (a little bit taller than in your animated GIF, above). Thanks for the kind words, and far catching all of my mistakes. I’m not sure but did the comment cut off part of your patch? It looks like it might have, but if not I have updated a second version of the file with your changes (see below). I have made some changes to the code that got it working on my Windows system that you can download here. But the fix is a pretty “hacky” as I have to resize the widget each time I need it to redraw! Let me know if it works for you. I’m thinking that there may be something I’m missing in my drawing code, but I just can’t see it right now. I’ll take a look into this further when I get the chance and re-upload a fully fixed version. Thanks again for the comment and the help, very much appreciated! (Sorry I took so long to get back to you – I hope this gets emailed to you). Version 0.2 actually works fine for me. (The original doesn’t work – I just tried both on a new installation of Ubuntu Edgy Eft). No Problem, I’m glad the new version works! I’m still meaning to look into this abit more to figure out exactly what the problem is. 1) How do you make a pixel map? I found that amazing! 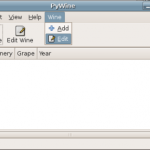 2) How do I integrate the star widget in the rows of the pywine program? Note: flavio’s comment was lost due to a database problem. Sorry about the comment problem. 1) I generated the pixmap in The Gimp and then used the contents of the generated file to create the python code. 2) I’m not sure about that just yet…it’s something that I’ve wanted to do, but it turned out to be much more difficult then I originally thought. Hopefully I can get something working and get it up here. Another article translated! I have used the second version because the first one didn’t worked well. Man, you are translating these way faster then I can ever write them! Thanks for you, of course! I want to translate all of your Glade-PyGTK by the next week..
Well keep up the great work! I really think that this will be a large help for anyone who speaks Spanish and is interested in these tutorials…plus you are helping me to find bugs! hi , In (pygtk) , how can I create a popup window and attach a picture (such az PNG or GIF formats ) to it. I want to hide window’s titlebar and borders. Actually, I want to show only the picture and nothing else. So all you want to do is display an image to the user? Do you want a window in anyway? Or just a window floating there? I would take a look at PyGame or the Python Imaging Library (PIL) . Is there a way to make custom widgets like this “buildable” with gtk.Builder? It would be trivial to implement the Buildable interface but then how does one get access to the widget from within gtk.Builder? To be honest I’ve never looked at gtk.Builder so I really don’t know. If I get a chance I’ll take a look. all ur tuts rule this site is brill if a littel small so keep up the brilliant work!! Hmm doesn’t seem to be working for me. I followed the tutorial through and I just got a blank window so I downloaded the source and it’s exactly the same. When I resize the window 5 stars appear but I cannot interact with them at all. I’m running Ubuntu Hardy. I can confirm what Karl wrote: I tested the source on both Hardy and Intrepid, on two different computers, and until the widget is resized one can move the mouse over the window and/or click, but “motion_notify_event” will never be called. Once the widget is resized, _every_ mouse motion (not only mouse first entering the allocation area!) triggers motion_notify_event, and notice that every event is a hint (the “else” clause in “motion_notify_event” is never called at all). I had problems with anoter app (I’m writing) which doesn’t catch motion hints properly. I tested this in OpenSolaris too, same behaviour: no “motion” event is catched and no star is drawn until the window is not resized. Great work Pietro, thanks for the information. I’ll keep my eye on that bug and update the code once it is resolved. IF I find the time I’ll try to find a suitable work around. I fixed your example. the problem was that “self.allocation” was gtk.gdk.Rectangle(-1,-1,1,1) which made the do_expose_event only repaint a very small area outside the actual widget. I will send you the updated code as soon as I get home. Great tutorial. I can confirm that Stuarts fix cures the redraw issue. In case anyone’s interested, I’ve made some modifications to allow for mouseovers, so the stars move with the mouse.